The TACTIX brand was developed with you in mind; tried, true and designed to work as hard as you do. The TACTIX brand is a complete line of reasonably priced, quality hand tools and storage systems that you can count on to be there when you need them the most and to stand the test of time. No matter what the job at hand is, TACTIX has the tool or solution to fit the bill. 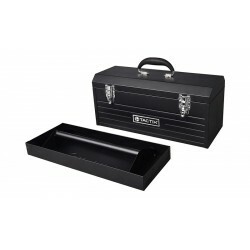 A fantastic carry case and storage box in one handy toolbox kit. Internal compartments and a strong sturdy handle which means you can carry as much as necessary with no problems. A brilliant modular toolbox that can be added to and expanded upon with additional TACTIX toolboxes. Heavy duty durable tool storage ready to be put through the paces of working life in a garage, worksite or around the home. The ideal sized steel toolbox for DIYers and professionals alike, steel design means its strong and features a soft grip handle for transporting. A tidy little 3 drawer toolbox with top storage compartment and 3 full extension ball bearing drawers. Lockable hinged lid also locks the 3 drawers. A fantastic impact-resistant plastic toolbox from TACTIX tools. Features handy tool tray and padlock feature for extra security. Please be aware: This item is available for 'Click and Collect' from one of our branches or delivery by pallet from £56.